The year is 1888. Twelve-year-old Will Henry lost his parents in a fire, and has been taken in by Doctor Warthrop, his father’s former employer, who has made him his assistant. But Doctor Warthrop is no regular doctor – he’s a monstrumologist, which is to say, someone who studies “life forms generally malevolent to humans and not recognised by science as actual organisms, specifically those considered products of myth and folklore”. He’s also someone who hunts these creatures should they pose a threat. This is exactly what happens when late one night someone knocks on Doctor Warthrop’s door with something they found on a graveyard on the outskirts of their quiet New England town – something whose presence there has horrifying implications. The Monstrumologist (called The Terror Beneath in the UK edition, and with a cover so ugly and so guilty of misrepresenting the book’s tone that I refuse to post it) has often been described as Dickens meets Lovecraft, which seems to me pretty apt. Yancey pays homage to both the nineteenth century novel and classic horror. He follows many of the conventions of both (there’s the use of a framing device to explain the book’s existence, for example), but the result is still something that feels fresh and new. 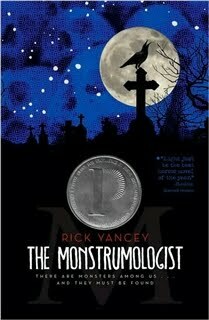 The language of The Monstrumologist is ornate and old-fashioned, and the tone is consciously and often humorously grandiloquent. I’ve seen children’s and YA literature be criticised for doing this in the past, but as Angie so brilliantly said not every book out there needs to be written with reluctant readers in mind and made to appeal to the lowest common denominator. There are young readers out there who revel in language every bit as much as adults do, and who are therefore likely to love a book like this. Yancey’s literary allusions go beyond his choice of tone – the creatures Will Henry and Doctor Warthrop have to face are Anthropophagi, mentioned in Herodotus, Pliny the Elder, and Shakespeare. I was particularly interested in the fact that although The Monstrumologist deals with monsters, there’s absolutely nothing supernatural about it. The story simply takes place in a universe where these creatures are part of nature, and the characters have to deal with the philosophical implications of this fact. These are, not coincidentally, not very different from the implications of many of the real discoveries about the natural world and humankind’s place in it that were made in the late nineteenth and early twentieth centuries. There are references to Darwin and Galton in The Monstrumologist, and the story engages with many of the dominant intellectual debates of the period. What does the possibility that we humans can be preyed upon by other species imply? How do we deal with not being outside or above nature? Yancey evokes some of the same sense of cosmic terror that draws me to Lovecraft, even though my own reactions to the facts that concerned him are entirely different. But unlike what happens in Lovecraft, this sense of our own smallness is not bursting all over the place. It’s far more deliberate and controlled – Yancey is a historical novelist, after all, and he’s in complete charge of his themes. Another thing that impressed me was how easily The Monstrumologist evoked a visceral sense of fear in me. Yancey perfectly captures the sheer panic behind the idea of being a prey, and he does so without conjuring a scenario which crosses the line into silliness. As a reader, I’m not very easily frightened: supernatural fiction interests me but doesn’t scare me, and thriller-type horror books are often more disturbing than scary. But The Monstrumologist made me shudder like I hadn’t in a very long time. Another thing I should probably mention is that the book is very gory and graphic. The results of the attacks of the Anthropophagi are described in detail – mostly clinically and detachedly, in a way that communicates Will Henry’s anatomical curiosity as well as his shock and horror, but still very explicitly. This is not something I have a problem with, but other readers might want to keep it in mind. If there’s one thing I wish it’s that The Monstrumologist had female characters doing things other than being eaten or used as monster bait, but I hear that the other books in the series redress this. If you’re thinking “Oh no, not another series!” and hesitating to commit, fear not – you can read The Monstrumologist as a stand-alone and be completely satisfied. However, I doubt you’ll want to. I know I’ll be picking up The Curse of the Wendigo very soon. If the doctor had known what horrors awaited us not only at the cemetery that night, but in the days to come, would he still have insisted upon my company? Would he still have demanded that a mere child dive so deep into the well of human suffering and sacrifice—a literal sea of blood? And if the answer to that question is yes, then there are more terrifying monstrosities in the world than Anthropophagi. Monstrosities who, with a smile and a comforting pat on the head, are willing to sacrifice a child upon the altar of their own overweening ambition and pride. As the town constable he had witnessed more than his fair share of man’s inhumanity to man, from petty thievery to maliciously battery. None of it had prepared him, however, for this naked confrontation with gross injustice, this horrific reminder that despite all the honours with which we shower ourselves, we are, ultimately, fodder, mere meat for the inferior, soulless things of which I dreamt the night before, no less than us the creator’s children. I adored that one! And it's actually gone over really well with the kids I've recommended it to here at the library as well, rhapsodyinbooks. We librarians just need to take opportunities to talk up and promote great books whenever we can, and the right audience usually WILL find them. As you—and Angie—said, not every teen book needs to be written with reluctant readers (or Twilight fans)in mind! And thanks for reminding me... *Curse of the Wendigo* really has been languishing in my TBR pile far too long. And I must get a hold of a copy of *The Isle of Blood,* too, since I know once I delve back into Yancey's storytelling I will undoubtedly want more! Dark, suspenseful, and unabashedly gory, this morbidly delicious Victorian tale is not for the faint of heart (or stomach). Twelve-year-old orphan Will Henry has nothing in the world but a too-small cap given to him by his father and Dr. Pellinore Walthrop, an eccentric “doctor” who studies and dissects real-life monsters. Will is his apprentice, and when a pod of hulking, headless, people-devouring Anthropophagi is discovered in a nearby cemetery, it is up to Will and the doctor to keep their sleepy New England town safe. There are plenty of moments of bloodthirsty violence and terror, but this stunning gothic adventure is more than pulp horror. It is filled with fully-fleshed, fascinating characters, from Will and the single-minded doctor, to a mysterious monster hunter who may be as dangerous as the creatures he hunts. Yancey’s writing is vividly descriptive and totally absorbing, and the story recalls the best of the classic horror writers—Stevenson, Poe, Shelley, Lovecraft—yet emerges as a unique addition to the horror collection. Ages 14 and up. With how many series I have going, I should think "oh no, not another series" but I love them so much I still get excited. :) This sounds like a great start to a fun series. I have heard others say that this book is a one of a kind piece of fiction, and I am very interested in it. I like the fact that it doesn't dumb down the language for its intended audience, and like a lot of the books you review, it is going on my wish list right away! Beautiful review, Ana! "There are young readers out there who revel in language every bit as much as adults do, and who are therefore likely to love a book like this"
OH MY GOODNESS YES! I can remember being a teen reader and picking up a book and going 'really'? Thanks for a great review! Certainly perfect for this time of year. This sounds very good indeed...bur scaaaaary :o!! Dickens meets Lovecraft? Awesome! Please tell me this is very light on the romance (my peeve with most YA)and I might actually give this a go. Also, the UK cover is horrible, but for once German publishers decided to produce a great cover, I love the style and it would really make me take notice in the bookstore. Oh my, the fact that this made you shudder makes me wonder if I could handle it. I first read about this book when his publisher decided not to continue pubbing sequels. I was intrigued at the outcry and have meant to pick it up since. I love that you say it's very visceral fear. The last book I read like that was The Terror by Dan Simmons. I highly recommend it if you like that sort of thing. Off to the library to see if they have this! The UK cover of the book is really sad. I also don't know why they changed the title. I really have problems when publishers change the titles and covers of book editions when they are published across the Atlantic. Most of the time the objectionable title or cover is on the UK edition. But once in a while it happens in the US edition also. I remember the title of Hans Fallada's 'Every Man Dies Alone' was changed to 'Alone in Berlin' which I felt was sad. Even worse was when Matthew Crawford's 'Shopclass as Soulcraft : An Inquiry into the Value of Work' (such a beautiful title) was changed to 'The Case for Working with Your Hands or Why Office Work is Bad for Us and Fixing Things Feels Good'. I don't know what got into the UK publisher's mind and why they should change a beautiful title into something so longwinded and so sad. This sounds like an interesting book. I have to admit I am thinking about starting yet another series with dread, but I probably will at some point anyway! I generally prefer UK covers to US covers, although by no means all the time. This however is ridiculous! I laughed out loud when I saw it! I understand that changing the title of books is sometimes for legal/copyright issues, and sometimes for marketing purposes. Your average UK readership will be slightly different from your average US readership, simply due to cultural differences. But changing the name to something like "the terror beneath", you've got to wonder who the publishers are marketing this to...in my opinion (as someone who has worked in the book industry) they are way off the mark. I love a good spine chiller especially with a bit of an historical setting....but then again I am rather squeamish so I'm totally in two minds about this book! I usually always prefer UK covers but when you said the UK one was awful I had to take a look...you're so right. If I hadn't read your review and had instead only seen the UK cover I can honestly say I would avoid this book like the plague lol! Ive never heard of this book before and it definitely sounds like something Id read, thanks for bringing it to my attention! That UK cover is awful! Do you think they went with that design because the UK publishers are marketing it to a different audience than the US publishers?